Pretty scenery! And cool sighting and photos of the Oystercatcher and your Plovers. They are cute plovers. Thanks for commenting Eileen. The plovers are fun birds to photograph because they are not so "flighty" as other shorebirds. Thanks for your comment, Carol. It's a great place to live and photograph. Thanks for commenting Tex! The wind was so strong on the way back that I just sat still and let it blow me in! Yes, I too, love your plovers and what delightful captures for the day, Mick, as always!! Hope you have a great week!! Enjoy!! Love your capture with the foam line of water! And the 2 birds - great capture! Thanks for your comment. As children we used to love to run through the foam and let it get all over us! - Happy Memories! Thanks Sylvia. It would be a super week if the wind would drop but it's stronger than ever this morning!. Maybe I should start taking photos of the effects of the wind!! I hope you get some low-wind days. Interesting to read your thought processes re. counting the birds. I see how it makes a difference. We bought ourselves a kayak for Christmas -- just ordered paddles. Hope we can make good use of it b/f too long. Hi Sallie, it's great that you have bought yourselves a kayak. I hope that it is an easy one to use and that you have lots of fun with it. I look forward to hearing more about it in the weeks ahead - and possibly seeing some photos as well - but make sure you get yourselves some good water-proof cases first!! I love those Paific Golden Plovers Mick - a nicely taken portrait. Nine would be heaven to me. They turn up in the UK occasionally where of course they become a massive twitch bird. Hi Phil, Pacific Golden Plovers are quite common around here - but grey Plovers are not and I would like to see more of them - and of course American Golden Plovers are possible but not likely! Lovely bird shots and great scenery. 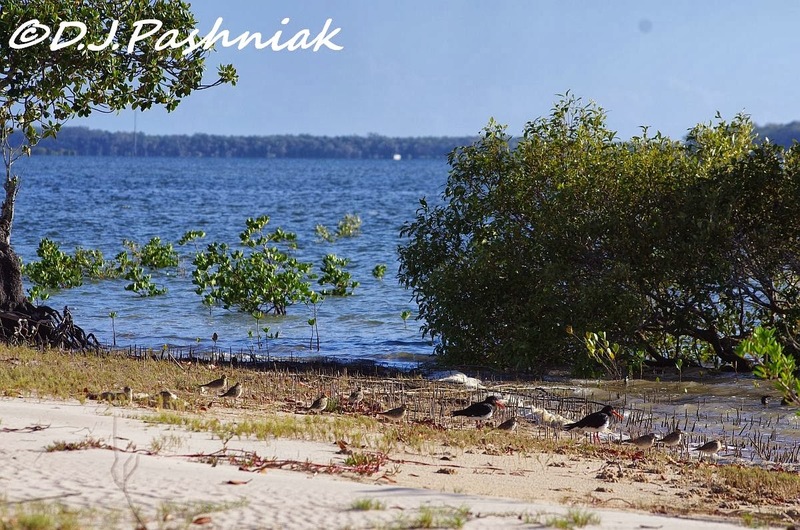 Beautiful scenery and photos of the plovers. They are smart bird when seen up close, on rare occasions we get one over here, and then it becomes a big twitch. Hi Gordon - Thanks for commenting - Phil said these birds are a big twitch for you over there. Some of your shorebirds would be similar for us - and I always wonder how some birds get so far away from their normal haunts. The golden plovers are beautiful...as are your scenic photos!!! Thanks Anni - I just need the winds to drop so I can get out on the kayak and see some more shorebirds while they are here. Thanks for commenting Christian and Hans. I'm glad you were able to get the 'yak out despite the windy conditions! I'm jealous of that Bar-tailed Godwit count! 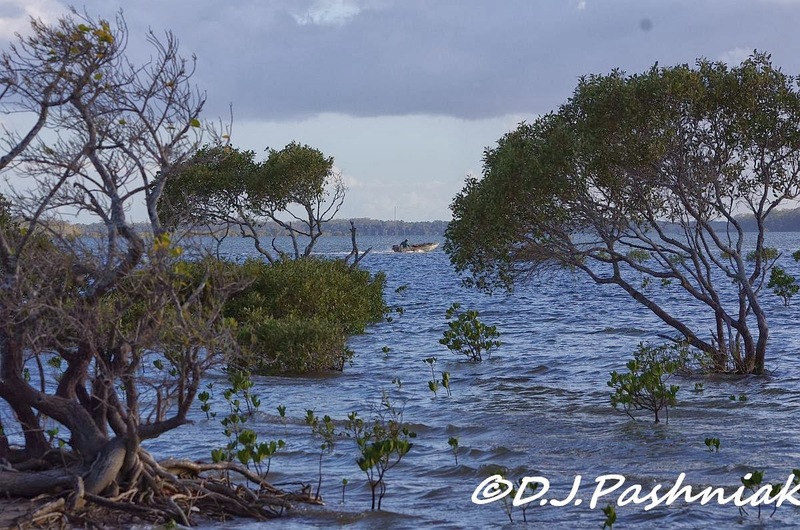 I just spent Sunday chasing a rare occurrence here on Florida's west coast but never found it. Beautiful shot of the plovers! Hope you get some relief from the heat soon! Cheers. Hi Wally, we see more Bar-tailed Godwits around here than any other shorebird - often in their thousands on some of the bigger roost sites. I usually ignore the Godwits and try to find the less common shorebirds among the Godwits. Some of the shorebirds you mention would be "mega rarities" for us! I'm glad you did see and count birds even if it was too windy to get many shots. The last photo is great. 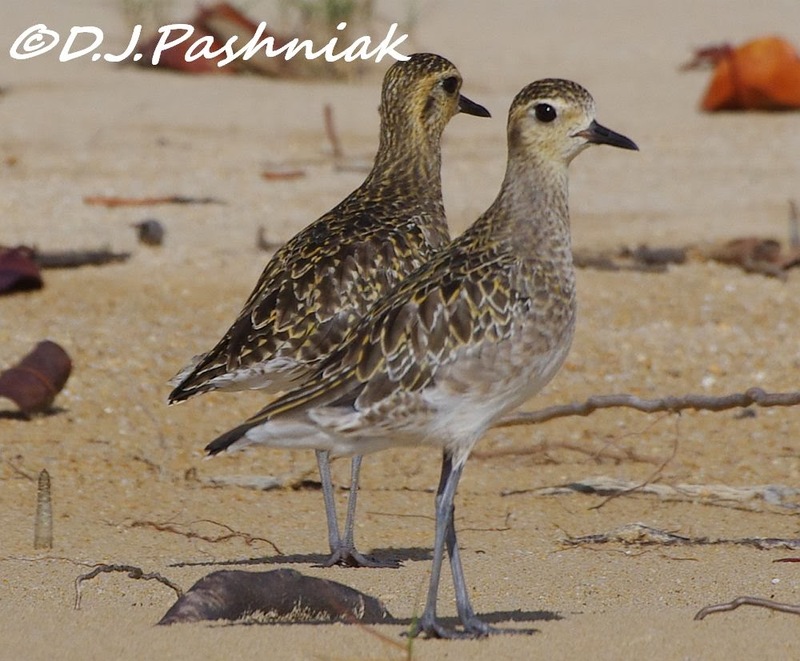 I love those pretty Pacific Golden Plovers .... I don't recall seeing them here in SA and so presume they are literally as the name says specific to the Pacific. Hi Dianne, I looked up some bird books and they both said that those Plovers can be found all around coastal Australia and also on some inland waterways. It would be interesting to hear from somewhere down your way if they have seen them there recently. I could do with a good paddle. Too bad the lakes and rivers are pretty much frozen! The Plovers are beautiful birds, they have lovey shaped eyes. Hi Karen, Sorry it is too cold over your way at present. During our winter you will be enjoying nice warm weather and I will be wishing for summer again! I understand your struggle with windy conditions. 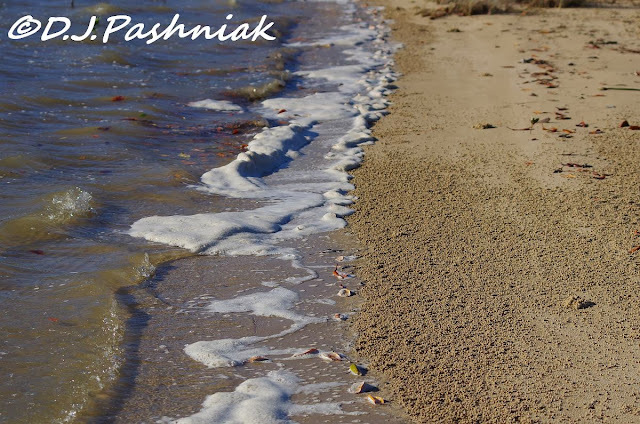 It is a shoreline hazard and very difficult to try to keep a camera still. We have many oyster catchers on our peninsula beaches - notably not in summer with holidaymakers and also notably in droves on windy days. I have not seen the golden plover, though we have signs saying that they should be around. Enjoyed your photos and commentary. Hi Gemma, I have been told that Pied Oystercatchers do better down your way than up here. In 10 years I have only seen young ones twice and territory where there used to be pairs is no longer in use. Fortunately we seem to have good numbers of migrants come here later in the year. May have been windy but your images are superb! you still took the opportunity so better to have tried than not to have tried at all..... well done. Hi Dave, I agree with that sentiment and I did enjoy it all even if it took a lot more effort in that wind. Nice close shots of the golden-plovers! They can be quite wary, as my shots of them demonstrate. Hi Kenneth, it was a very still morning and I was in the kayak - which always let you get closer. Nice birds - all counts are worth while I think. Thankfully its a lot cooler here now. Thanks Stewart - I appreciate the time and effort you take to keep this meme running! Great photo of the Golden Plover. Hope the weather is better now. Thanks Nora - just wish I could send some heat over your way - we are having another heat wave with very unpleasant conditions.